Lux Assure, a specialist in the provision of chemical monitoring and management solutions, and the University of Strathclyde have secured a grant from the Oil and Gas Innovation Centre (OGIC) to further develop Lux’s successful CoMic technology to provide the industry’s first corrosion inhibitor micelle detection tool with automated data analysis capability. Supporting a major technological advancement, the recent investment will see a partnership between Lux Assure, OGIC and leading signal processing and data analysis researchers at the University of Strathclyde. The project will develop CoMic’s existing manual analysis methodology, create bespoke algorithms and exploit novel mathematical techniques to automatically analyse data gathered during on-site chemical tests. Discussing the project, Lux Assure CEO Emma Perfect says: "This project will enable Lux Assure to provide information to our clients both on-site and in real-time, informing them of optimal corrosion inhibitor dosage and enabling prompt decision making on chemical injection. "Chemical use plays an important part in protecting oilfield assets, and technologies such as CoMic enable better chemical management. Off-site data processing and evaluation is currently required; this leads to delays in obtaining results and can be a barrier to sales where data cannot leave the oilfield being monitored. Automated data analytics tools for use on-site, will facilitate quicker decision-making and deliver significant benefits to clients. Evolving the business towards providing such tools is of huge importance to us." Dr Paul Murray, Lead Investigator at the University of Strathclyde, adds: "It is very exciting to be working closely with Lux Assure to conduct research and develop novel algorithms to automatically analyse data gathered by their highly innovative CoMic technology. Recognised as one of the UK’s leading technological universities, our partnership with Lux Assure and OGIC is an excellent example of Strathclyde delivering innovative technological research which will have a significant impact in the oil and gas sector." Ian Phillips, chief executive of OGIC, says: "Asset integrity management is vital to ensure that offshore operations are carried out safely and efficiently. The technology being developed by Lux Assure is an excellent example of how automated data management can bring major benefits to offshore operations. This technology has the potential to improve chemical monitoring on projects while reducing costs and increasing efficiency, as the real-time relay of data will allow decisions to be made proactively." Inspired by technologies used in life sciences, CoMic is an on-site chemical monitoring technology used to maintain asset integrity through delivering effective corrosion management, by informing management of corrosion inhibitors and providing data on the optimal level of corrosion inhibitor. This project is the next step in the evolution of the product, as Lux Assure continues its efforts to fully meet its clients’ needs by employing cutting edge technologies derived from all scientific domains. The technology was redeveloped in 2017 to create the world’s first operator-deployable corrosion inhibitor detection tool. Lux Assure currently delivers two key technologies, CoMic and OMMICA, which together represent a revolution in monitoring and managing difficult-to-detect chemicals on-site in oil, condensates and water, specifically the thermodynamic hydrate inhibitors and corrosion inhibitors used to protect oilfield assets, on and offshore. 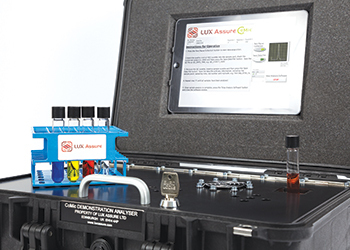 Lux Assure is a UK-based company which delivers on-site chemical monitoring technologies to the oil and gas industry. The company’s innovative technologies provide operators with unique solutions for monitoring difficult to detect chemicals which are widely used across the industry, providing critical information to support key management decisions. The company aims to help clients achieve enhanced long-term asset integrity management through the optimising dosage of corrosion inhibitors, and to achieve time and cost savings through accurate, on-site analysis of MEG and methanol in produced oil field fluids. With head offices in Edinburgh, Lux Assure has a network of worldwide agents. OGIC provides a single access point to the knowledge and capabilities of Scottish universities for the oil and gas industry. It also part-funds and provides management support to projects that have the potential to deliver technology solutions for exploration, production and decommissioning challenges facing the UK Continental Shelf.